Nationality: American. Born: Waterbury, Connecticut, 4 June 1908. Education: Attended Notre Dame Academy, Waterbury; Marymount School, Tarrytown on the Hudson, New York; American Academy of Dramatic Arts, New York. Family: Married Frederic Brisson, 1941, son: Carl Lance. Career: Toured in a tent show; 1929—joined the Copley players, Boston; appeared in Garrick Gaieties in New York, on tour with Roar China , and in Talent and Second Man ; 1934—contract with MGM: film debut in Evelyn Prentice ; 1953—on Broadway in Wonderful Town , and then in Auntie Mame , 1956, and in film version, 1958. Awards: Jean Hersholt Humanitarian Award, 1972. Died: 28 November 1976. Life Is a Banquet , with Chris Chase, New York, 1977. Yanni, Nicholas, Rosalind Russell , New York, 1975. Parish, James, and Don Stanke, The Leading Ladies , New York, 1977. Current Biography 1943 , New York, 1943. "Rosalind Russel (sic)," in Cinéma (Paris), February 1977. Bowers, Ron, "Hors d'oeuvre," in Films in Review (New York), April 1977. Frank, Michael, "Rosalind Russell: Auntie Mame at Home in Beverly Hills," in Architectural Digest (Los Angeles), April 1992. 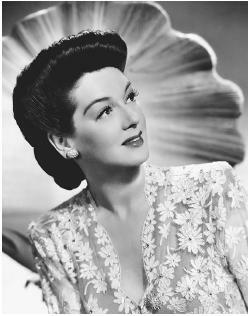 In 1965 Rosalind Russell gave David Zeitlin of Life magazine her prescription for success in acting: "It's okay to have talent, but talent is the least of it. In a performance or a career, you've got to have vitality. I've worked with actors and actresses far better than I'll ever be—as far as talent goes. But what they have just doesn't register because they don't have a . . . drive underneath a project. . . . Sometimes what you have to do is almost claw your work onto film." That two-fisted approach worked well in such larger-than-life characters as Sylvia Fowler ( The Women ), Hildy Johnson ( His Girl Friday ), Ruth Sherwood ( My Sister Eileen ), Mame Dennis ( Auntie Mame ), and Rose ( Gypsy ), but badly in more subtle or multidimensional roles as Lavinia Mannon ( Mourning Becomes Electra ), Bertha Jacoby ( A Majority of One ), and Louise Harrington ( Five Finger Exercise ). Still, despite her excesses, Russell cornered the market on the intelligent, fast-talking, well-dressed career woman, and her superb comic timing was arguably the best in the business. Russell's film career can be divided into roughly three periods. In the 1930s she played the "other woman" in major films and the resilient leading lady of minor ones, usually getting Joan Crawford's or Myrna Loy's discarded roles. Her first real break came in 1935 when Myrna Loy decided not to play opposite William Powell in Rendezvous , a spy comedy in the Thin Man tradition. Russell's first starring role came a year later when MGM lent her out to Columbia to do Craig's Wife . Though too young for the part, she received excellent notices as a fastidious, domineering housewife. Despite this critical acclaim (or perhaps because of it), she was still locked into a type—the young, well-dressed sophisticate. The Women marked a transition in her career and made her a star. Russell played a malicious chatterbox in a flamboyantly exaggerated comic style. Producer Hunt Stromberg had intended to cast Ilka Chase (who originated the role on stage), declaring Russell "too beautiful" and "a fine dramatic actress, but not a comedienne." Russell kept pushing for the part and made five tests until she got it. After The Women Russell was accepted enthusiastically as a full-fledged comedienne and in 1940 played the role for which (with the possible exception of Mame) she is most remembered—Hildy Johnson. With a breakneck, clenched-teeth delivery, she deflates the lesser mortals around her (all men), lighting her own cigarettes and disarming a murderer, while trying to decide between a career (newspaper reporting) and marriage. She gets them both in the end, but opts for conniving Cary Grant (one of the few leading men able to stand up to her on screen) over the mealy-mouthed Ralph Bellamy. Throughout the 1940s Russell played a seemingly endless series of career women with (she claimed) essentially the same office set. Once again she had been typecast. Although the 1940s brought her three Oscar nominations for parts deviating from type ( My Sister Eileen , Sister Kenny , and, inexplicably, Mourning Becomes Electra ), only My Sister Eileen was commercially successful and her career went into a decline. By the 1950s Russell was too old for her "type," so she returned to the stage, appearing in Bell, Book and Candle, Wonderful Town (a musical version of My Sister Eileen ), and Auntie Mame . She appeared in a few films during that period, the best of which was Picnic , for which she undoubtedly would have been nominated as Best Supporting Actress had she agreed to be considered for that category. Russell's two-year stage role as Mame Dennis led to her best film in over a decade— Auntie Mame . Modeling the role on one of her sisters, she received a fourth Oscar nomination for her zany portrayal, but did not work again in film until three years later. With the exception of Gypsy , which offered her a part large enough to encompass her pull-out-all-the-stops theory of acting, Russell's film roles in the last decade of her career were an embarrassment—either because she misunderstood the characters (e.g., Bertha Jacoby and Louise Harrington) or because the films themselves were bad (e.g., Where Angels Go, Trouble Follows and Mrs. Pollifax—Spy ). Discussing her career, she remarked: "There are only two ways to get ahead in Hollywood. You either have to get one great picture a year—these propel you forward—or your impact has to be made with a lot of pictures." Clearly she went the latter route, her vivacious intelligence and snappy delivery remaining in our memories in the leaner years of her career. I have been trying to remember the name of a film starring Rosalind Russell in which she tried to make money supporting her family by directing parking at a world's fair, probably the one in Chicago (1934). I see nothing in her filmography that would suggest such a movie. Any clues?